The Sacrament of Matrimony establishes a holy covenant among three: one man, one woman, and God himself. Through God the Father, marriage irrevocably joins the man and woman as one flesh, thereby making them stewards of God's unitive and creative power. Through the Son of the Father, marriage receives the dignity of a sacrament, becoming a reflection of the ever-faithful bridegroom, who loves, forgives, and lays down his life for his bride, the Church. Through the Holy Spirit, marriage unites man and woman in an indissoluble communion of life and love. Within this week World Marriage Day is always observed on the second Sunday in February. In 2019 World Marriage Sunday is Sunday, February 10. 1. Facts: What you should know about Catholic marriage. 2. Stages: All healthy marriages experience changes and transitions. 3. Prep: Marriage preparation is offered around the diocese. Find a schedule here. 4. NFP: Natural Family Planning is a safe and effective approach for couples. 5. Tips & Advice:for a happy & healthy marriage. 6. 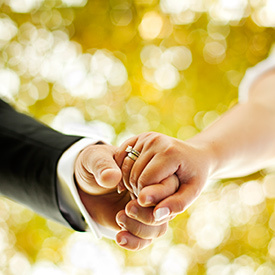 Planning a Catholic wedding requires careful consideration.